2017 was an exceptional year for restaurant openings in London: Claude Bosi took the helm at Bibendum, Gordon Ramsay’s alumni Clare Smyth decided to go it alone with her first solo venture Core, and husband and wife team, Monica and David Galetti, opened their first restaurant together, Mere. After earning her stripes working in Le Gavroche for 12 years, rising to senior sous chef, then head chef at Le Gavroche des tropiques in Mauritius, coupled with her recurring stint as a judge on Masterchef: The Professionals, there was always going to be an immense amount of fanfare surrounding Mere, given both Monica and David’s industry experience. With a name as well-known, well-liked and well-respected as Monica Galetti, it’s no surprise Mere (the name of Monica’s mother, pronounced Mary) has people talking for all the right reasons. The restaurant, located on Charlotte Street, is a split-level operation. Concealed behind a large wooden door lies a ground level bar; decked out in navy velvet sofas, dark marble tables and striking pieces of art. The plush interiors were designed by leading architecture and design company, Softroom. It’s unstated yet elegant, and while the bar is a lively spot, the subterranean restaurant operates at a gentler pace. The space is filled with an abundance of natural light thanks to a large glass atrium, while a traditional Samoan siapo or tapa cloth dominates the main dining room wall, designed and made especially for Mere by the artist and cousin of Monica, Solomon Daniel, in New Zealand. 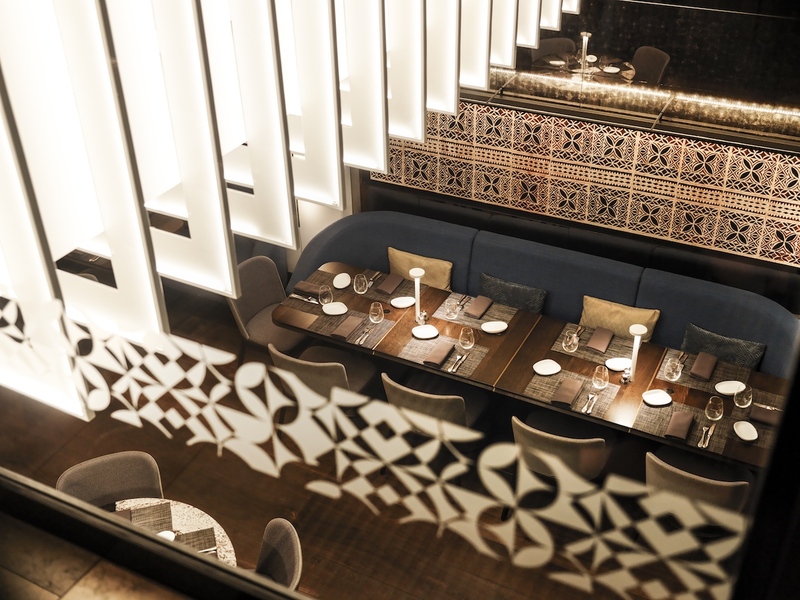 Much like the food, the decor follows suit: refined, modern and stylish. Service is attentive, without the general stuffiness and over exuberance which always seems to be the order of the day in other high-end establishments. The menu positions itself as French (a nod to David’s childhood), with dishes peppered with flavours from exotic South Pacific and New Zealand, paying homage to Samoan-born Monica. A recent lunch began with an amuse bouche of mushroom arancini – deep-fried balls of rice spiked with molten cheese, and encased in a duvet of breadcrumbs. And the warm, freshly baked bread with salted butter was eaten with immense pleasure. Dubbed ‘the house favourite’,pumpkin agnolotti with mixed mushrooms in a Marmite emulsion (£13) hit all the right notes. The flavour merry-go-round danced between gloriously plump pasta parcels filled with a decadent pumpkin puree, to the contrasting subtle Marmite sauce. A sensational dish with varying sweet and savoury notes. For mains, the pan roasted Rose veal was beautifully presented. A mélange of perfectly pink veal, glossy sweetbreads with a satisfying crispy outer, brown butter mash and charred hispi (£34) all came together on the plate. This is what smart and precise cooking tastes like. The pigeon dish, a Monica staple, was a joyous, happiness-inducing plate of food. 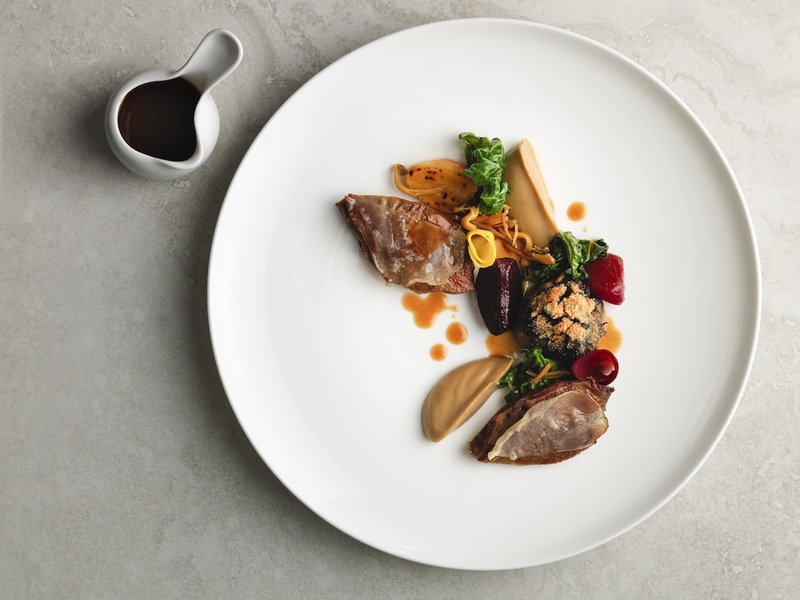 The pigeon main (£34) was the perfect dish to eat this time of year: the warm, nutty yet delicately sweet flavour of the pigeon breast shone through, and the Pedro Ximenez sauce added another extra sweet flavour to the plate. The desserts were a triumph: the hokey pokey (£12), which received a nod of approval from David upon ordering, was presented like an art project. It was a tower of pure, unadulterated joy. Think a crispy, almost biscuit-like bottom, covered in an assortment of Manjari Cremeux, salted toffee, and hunks of honeycomb. And finished with a table-side serving of grated dark chocolate – the good stuff. Also on offer was the blackberry treacle tart (£11) with blackberry ripple ice cream (there was, however, no need for the pot of whipped sour cream it was served with), a fancier version of a childhood classic was a comforting bite with a welcoming nostalgic kick. It hummed with autumnal flavours and that buttery, pastry casing was excellent. Faultless, even. As you’d expect, David’s wine list didn’t disappoint; it was a treasure trove of bold reds and crisp whites. It sang with enthusiasm, and predominantly featured wines sourced from New Zealand and France (a theme that is apparent throughout most of the restaurant). Mere is a wonderful restaurant that puts its best foot forward when it comes to both dining and service. 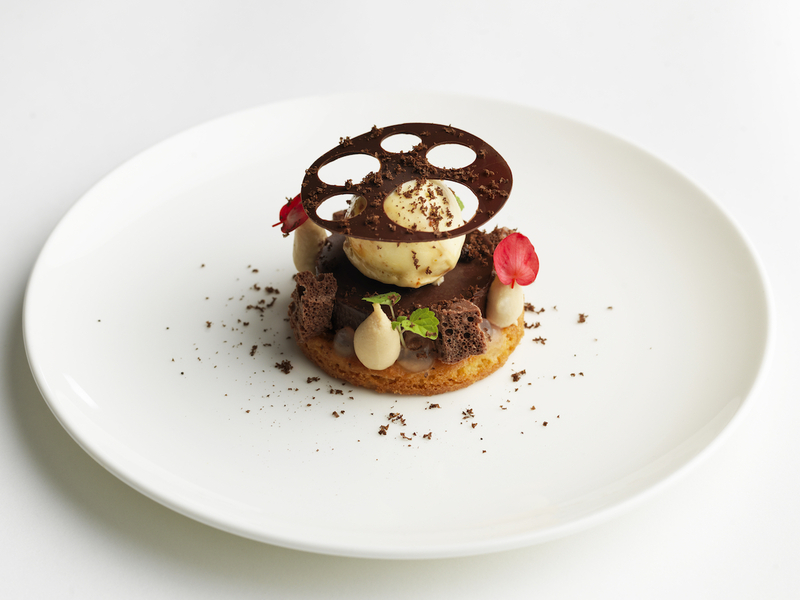 The cleverly crafted and well put together flavour combinations prove that both Monica and David are London’s restaurant powerhouse duo. Long may it continue. Mere can be found at 74 Charlotte Street, London, W1T 4QH.